Chinese are practical people. They do things to achieve outcomes – either gaining good fortune or to prevent losses and disaster. The principle of life for the Chinese is “趋吉避凶 go after good fortune (i.e. blessings, not just money. The Hebrew word shalom, meaning complete or peace in body soul and spirit may be a closer meaning) and stay away from disaster. Such principle comes from the Ancient Chinese I-Ching philosophy. Chinese Management Guru and Scholar Zeng Shi Jiang has very good speech on this 易经的奥秘(15)超越吉凶 易经 曾仕强 However, it is in mandarin. He is encouraging people to do better, going beyond gain & loss, fortune & disaster, to seek after what is right and wrong and do the right thing and the right time in the right situation for the right cause. In the speech, he highlighted 4 outcomes of I-Ching, which are 吉凶悔吝。When we are in good fortune 吉, we tend to relax and commit error like over drinking and getting lazy. If we are alert, we will 悔 repent and move back to good fortune. However, if we just attribute our failure to others, blaming 吝, and take no corrective actions, we will end up in disaster 凶.
I-Ching has a set of strategies, described in 64 hexagrams and 384 stage-lines telling in what situations, taking what actions, will lead to what kind of outcomes. The fundamental principle is seeking after Truth and persevere in Righteousness and keeping purity. I put this outcome at the center. We don’t talk about gain or loss, just about what is true and right and pure. Prof Zeng said that gain and loss is from man’s point of view. For the view of nature or heaven & earth, there is no gain or loss attributed to any event. It is just natural events, the usual and normal sequences of life that go on and on, seasons after seasons. Nevertheless, we are human living in this world. Our actions will produce result that bring gain or loss to ourselves and our community. In this present globalization, our actions affect the world. 悔 Repent & Correct: Deviation from truth bring you down the part of disaster. However, if we detect early and repent, and take corrective action, we will be building on the truth and walking on the path of truth and righteousness to abundance and progress. This is why I put ‘Repentance’ on the gain side rather than on the loss side. Repentance is not just saying sorry but taking corrective actions to move in the right path. 利 Advantage / Benefit: Moving on the right path will us in an advantageous or beneficial position. Knowing is not go enough and we must choose to take the right action. 亨 Flow / Progress: A key concept in I-Ching is flow, or smooth, unobstructed flow of progress. I actually have difficulty deciding to put this at the top above 吉 Gain / Fortune or not. I think flow, or progress is a more important concept that just good fortune. Abundance is a stagnation. Flow is an ever progressing state. 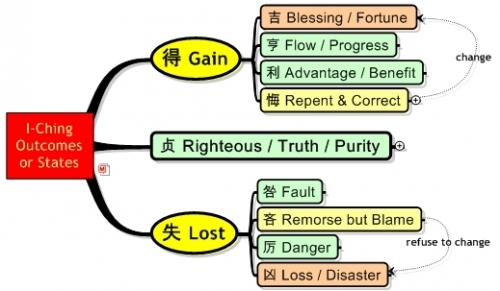 吉 Gain/Blessing / Fortune: As explained above, 吉 Gain / Fortune is more than just money. A closer term for the present may be 福 blessing. A concept of abundance, harmony, joy, complete, for lot of people together. If this is the concept, I will put it at the top. The 2nd Principle of I-Ching is then Build on the Truth and Attain Blessing of Harmony & Completeness & Abundance. The world has been very defect fixing focus. Partly caused by Medicine of fixing sickness and the Total Quality Movement. There is nothing wrong with defect fixing and sickness curing. They are necessary. But they are not enough. Fixing defects/sickness bring to normal or average. It does not make you a champion. Chinese medicine in the long past has also concentrated on keeping a healthy and long life. 吃补 eating supplements for good health is a long term and common Chinese practice. Psychology has moved from defect fixing into Positive Psychology. Appreciative Inquiry practice is method based on building on your strength to become champions rather than focusing on fixing weakness and defects. third principle of I-Ching is about anticipating, preventing disasters and minimizing their impact. 咎 Fault or Error. Controllable disasters do not just happen (even uncontrollable earth quakes can be predicted). Some cracks or faults happen first. We must be watchful and be aware of them first. Take action before it become serious. But a typical reaction of human being to discovered faults or mistakes is to blame others. 吝 Remorse but Blame: If we are just sorry for the bad consequences of the fault and the blame others for causing it, then we will not take any corrective action on our parts. What will the situation become. Someone says “Madness/Stupidity is expecting a different result from doing the same thing”. Not taking corrective action will result in 厉 Danger. 厉 Danger: Uncorrected fault over time will become a danger. The cracks and widen and deepen. The problems are more apparent and obvious. There is little accuse for not taking action. But strangely, people just ignore the warning. This may be due to interest “xbody” story. 凶 Loss / Disaster: The eventual happens – a big disaster. Actually, it could have been prevented is the teaching of I-Ching has been followed. I-Ching teaches 居安思危 – when in peace we think about the danger. We takes steps to prevent it and also to minimize its impact in case it does happen. Hope you have gain a good understanding on the purpose of i-Ching and go into the details and learn about the strategies to build on the way of truth and righteousness to harmony and abundance and at the same time preventing disasters. You may want to start with Learning from I-Ching Part 06 Steps for Application. This entry was posted in I-Ching, Thinking Skills by limliat. Bookmark the permalink.